I’m at it again with the cheesy pie! So, remember the spaghetti squash pie from last fall? My most popular blog post to date for reasons that I can’t grasp completely? 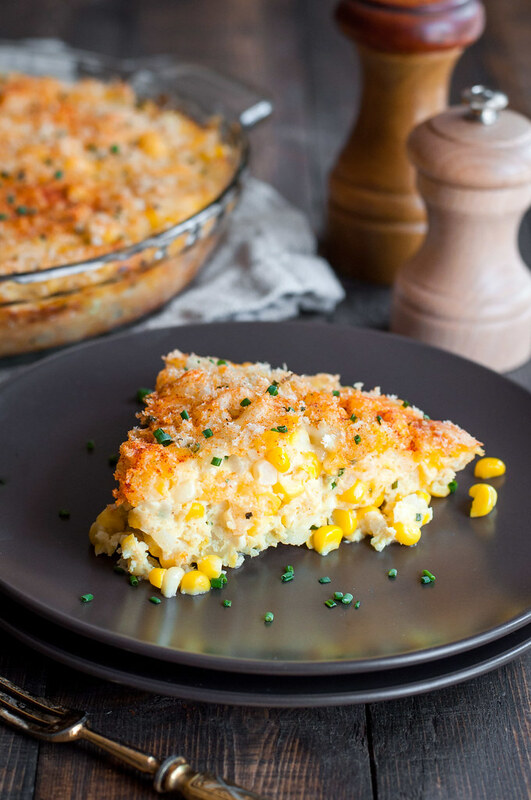 I’m taking a shot in the dark, guessing the reason y’all love it so much is because it’s a) in pie form and b) full of cheese, and hoping that you’ll like this cheddar sweet corn pie for all the same reasons. You definitely get bonus points for hunting down some fresh summer sweet corn and sawing it off the cob (or 6 cobs) yourself, and those bonus points come in the form of juicy, bursting kernels in every bite of sweet corn pie. The truth is, though, I’ve tasted some pretty darn good frozen sweet corn, especially when opting for the organic variety (I get mine at Trader Joe’s). While it was severed from its cob long ago, frozen corn will be 99.999999% as rewarding as fresh in this pie. And you don’t have to deal with shucking and those super annoying corn hairs that get stuck in your teeth and the crevices of your kitchen. What has manifested as sweet corn pie actually started out, and I guess still is, part of the gratin challenge. Madison names it corn pudding in the book, and the first time I made the recipe that’s basically what it was. I scooped it out of the pan into a big pile of cheesy corn on our plates, leaving a trail of corn juice in the pan. Corn juice: it’s a thing. I set up a photo shoot for the first attempt, but days went by and I just kept thinking about those pictures. Obsessing. They weren’t what I was going for. Generally, when I bake something in a pie plate, I want it to look like pie. 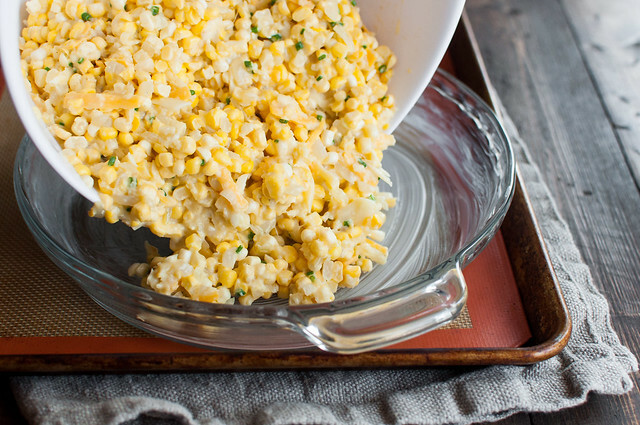 Not a steaming pile of cheesy corn, however delicious it might be. In the end, I had to make it again. 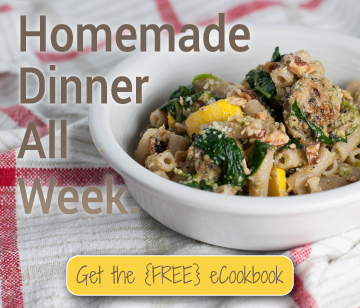 I knew it could be better, and I’m including it in the upcoming first free NCK weekly meal plan, so I wanted to make sure it’s quick enough for a weeknight. Oh, and of course, I wanted a cohesive pie slice. Unlike real life (sometimes), I got everything I wanted. Here’s how: I cut back on the liquid, left out the corn juice, added an extra egg, and, instead of sharp cheddar, made sure to go for nice soft mild cheddar and fontina. Cheese party up in here. I cut out the whole ordeal of making fresh bread or cracker crumbs in the food processor, which not everyone has, and used panko for the best of both (bread and cracker) worlds. I baked the pie at a slightly higher temp than in the original recipe to cut down on cook time and get a little bit of a golden brown color on top. And I added chives, because I had them in the fridge and they add color, freshness, and contrast. Totally optional on the herbs, though. Sweet corn pie comes as a welcome break to a new dinner routine that Steve and I have going called…beans and rice. For days. I mentioned that I’m trying to discipline myself to cut down on elaborate dinner recipes in the wake of our upcoming wedding, which resulted in a very large pot of overly spicy black beans this week. I did so good cooking in bulk to prep for the week, but I loaded those beans down with some super fresh and potent hot peppers from last week’s CSA pickup. I mean, they didn’t smell that strong when I was cutting them up, so I figured any heat would get tamed as I sweated down the peppers and onions. Ummmm, not this time. I can barely eat the things short of a huge dollop of sour cream and/or half an avocado to cool the spice factor. Tonight I’ll continue my pilgrimage through the bean leftovers with approximately three spicy bites, accompanied by a big ol’ piece of cheesy sweet corn pie. In all honesty, I’m not sure how long I’ll last staying out of the kitchen to focus on wedding planning. Yesterday I had the whole day free to develop the first NCK meal plan and do silly activities like shop for wedding shoes. Dream come true, right? Wrong. I’m quickly realizing that both cooking and physical activity are crucial to my happiness. All day yesterday I was just kind of sullen and unmotivated, literally staring at my computer screen with hours to spare and I couldn’t bring myself to type a single word. Call it an off day, but given my career path, I think I might be right on the money. Obviously, balancing modern life and making a living with our innermost needs for creativity and movement is a huge challenge. I’m lucky enough to have embarked on this journey of business ownership, but that doesn’t mean I can just play in the kitchen and practice yoga all day long. So I’ll just keep evaluating day-to-day, working in a little more time in the kitchen and on the mat, and hopefully keeping stress in check until November 7th arrives! Want to know when the free weekly dinner plan is live? Sign up for email updates or check back to the “meal planning” tab at the top of the page. 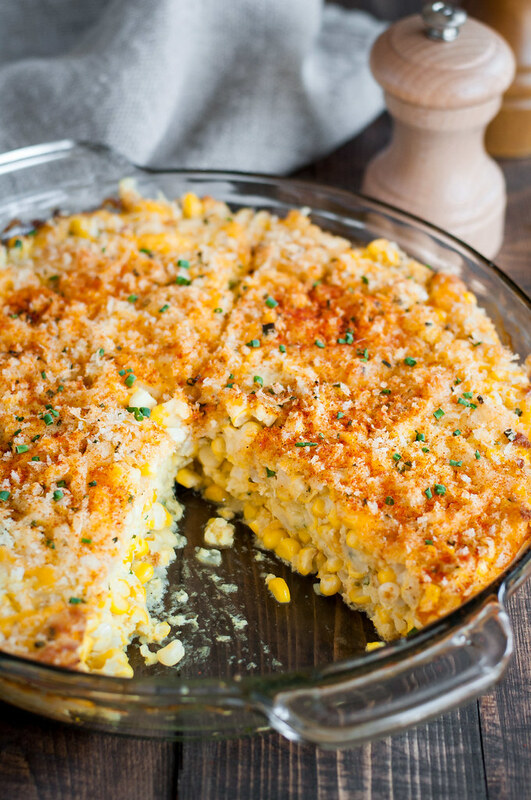 Sweet corn and salty cheddar, juicy kernels and crispy breadcrumb topping, this cheesy pie is the perfect marriage of farm fresh produce and comfort food favorites. It's ready for the oven in 20 minutes and tastes just as great reheated. Preheat oven to 375 (F) and move rack above middle position. Lightly butter a standard sized pie plate. Melt 1½ tablespoons butter in a medium skillet over medium high heat. Add onion and cook about 4 minutes, until slightly browned at edges. Turn heat down to medium, add garlic, and cook 2 to 3 minutes, until garlic is fragrant but not browned. Combine onion/garlic mixture in a medium mixing bowl with corn, milk, 1½ cup cheese, ½ cup panko, salt and pepper, and chives. After stirring, add eggs and mix well. Pour mixture into prepared pan. Melt remaining ½ tablespoon butter, let cool slightly, then combine with ¼ cup panko, ½ cup cheese, ½ tablespoon chives, and a pinch of salt and pepper. Sprinkle over the pie filling. Bake (on a rimmed baking sheet for easier handling) about 35 minutes, until slightly puffed, set, and beginning to brown. Cool 5 to 10 minutes before serving, topped with a dash of paprika and more chives, if desired. The pie keeps well for a couple days (at least) when prepared and baked in advance. It would be delicious for an end of summer brunch! Just add mimosas. Note: This page contains affiliate links. It does NOT contain sponsored content. 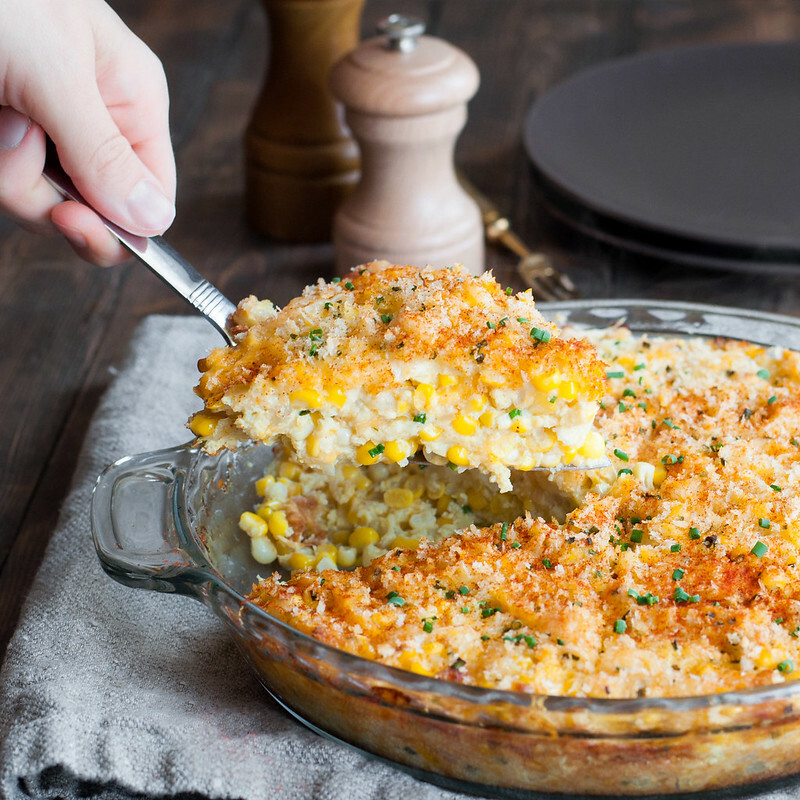 Affiliate links (to products I recommend, on Amazon) offset my ingredient and website maintenance costs, so I can keep bringing you corny recipes like this one. Thanks! This looks so summery and delicious. I plan to make it tonight. Thoughts on adding a little drizzle of fresh tomatillo salsa? Girl we are on the same wavelength…I think that sounds divine! comfort food at its best! this looks divine tessa. Just purchased some fresh sweet corn yesterday, which you can only find seasonally here in Belgium. Making it tonight. Awesome! It’s best when it’s at peak season anyway–enjoy. You are the cutest gal and I love your recipes. P.S. 80 year young great grandmother. By the way, great recipe. Will for sure make. Looks and sounds so yummy! Dana and Joanne–thank you both for the kind words! I will keep the recipes coming as quick as I can :) Also, sorry to miss your comment Joanne! Sometimes I accidentally pass over one, but caught it thanks to Dana’s response this time. 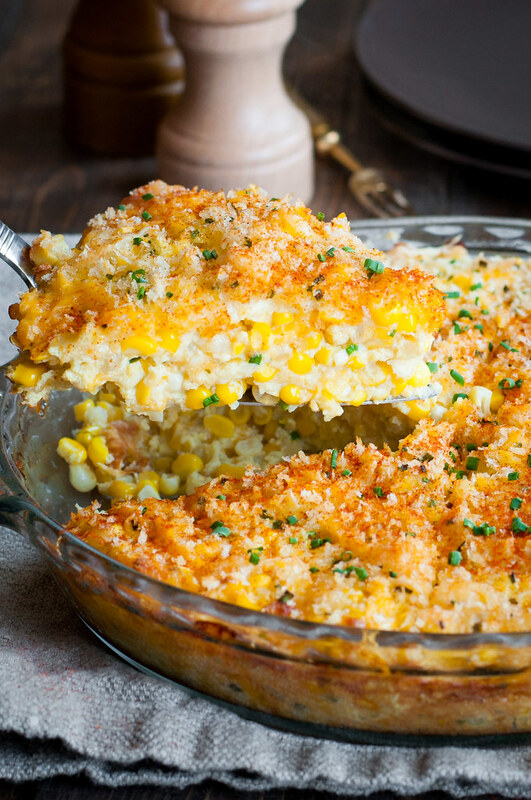 This combined my love of corn with my love of cheese, it’s amazing! I think I’m going to try this with other vegetables as well, maybe peas and carrots, since they’re about the same size. Honestly you’re a genius for coming up with this, thank you! Thanks Atifa! 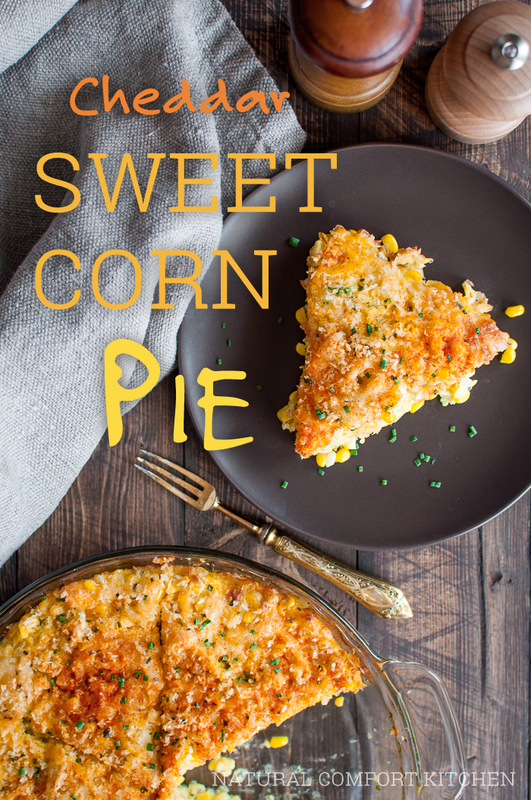 I can’t say I’m the first to invent sweet corn pie, but to brag a little, I’m a fan of my variations on it…have to have some cheesy treats once in a while! I saw your blog and this recipe for the first time this morning, just before visiting our local farmer’s market to buy corn. We had this for supper tonight and it is wonderful! Simple, fresh ingredients, quick and easy to put together, and yet it looks and tastes as though I spent far more time. 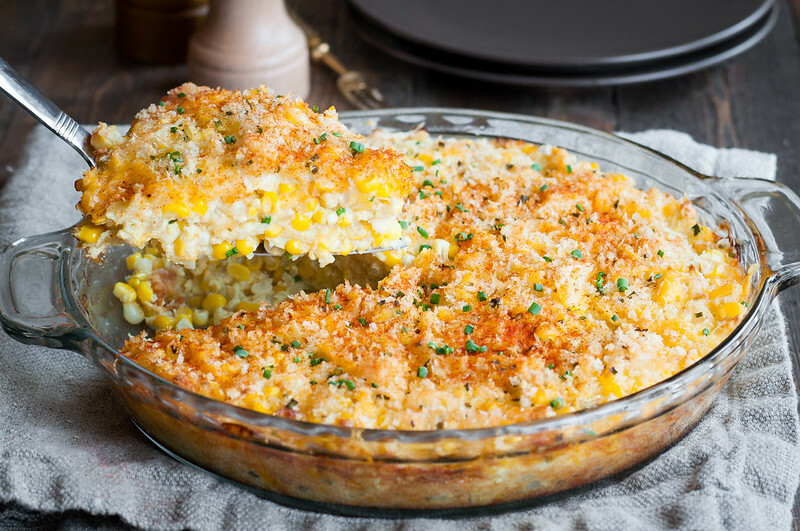 Corn, onions, cheese and a crunchy topping – who wouldn’t love this?! Thank you so much, Tessa, I will visit your blog often! This looks fabulous – and and so bright – perfect summer dish! I plan to make this today. What about a cheese mix of cheddar and provolone or cheddar & colby jack? Would those work together? I was also thinking about mix veggie – corn, peas carrots? Think that would work too? Hi Gabriella! Those changes all sound good. Excellent choice of cheeses, and as long as the veggies are small or chopped about the size of corn kernels, without a super high water content, they should work. I would stay away from summer squash or bell peppers, for example, but carrots or other root vegetables won’t waterlog the dish. To make sure they cook through, you may want to give them a quick roast or sauté before mixing them in. Any suggestions? Perhaps less corn? Arian–so sorry! Really with the eggs in there it should firm up no matter what, even with a bit of extra liquid. I would say double check your quantities, and if that fails grab a super inexpensive oven thermometer. When I did that I finally understood why dishes like this took FOREVER in my oven–it runs super low. Finally–what kind of milk did you use? Whole and 2% will both work. By plant milk, I’m generically referring to any kind of non-dairy milk (soy, hemp, almond, etc. ), in case you’re trying to take the dish to a slightly more healthy place (obviously it won’t be dairy free, given the cheese). Hope you enjoy it! Thank you for the reply! I do actually have some almond milk (now that you explain it, I’m kind of like “duh”!). I’ll be making this tomorrow night & I can’t wait! No problem–let me know how it comes out! When I see the recipe on my computer it doesn’t give an amount for milk, just a square…weird huh? I want to make this for Thanksgiving, help! Melanee–so weird! I’m not having a problem on my end, so not quite sure what the issue is. Milk quantity is 2/3 (two thirds) cup! Hoping you see this and get to make it for Thanksgiving! PS Can you see the other fractions in the ingredient quantities? Yup :) I can see all the others, thank you so much for the prompt reply! What else can we use to replace the eggs? Inder, unfortunately (for egg allergies) the eggs are relatively crucial in getting this recipe to work. I’ve not used egg substitutes (such as eggbeaters) before, but I think that may be your best shot. It’s possible some variation with silken tofu might do the trick as well. If either of those work for you I’d love to hear back. Emily–definitely. I like whole milk in cooking for the richer taste and texture, but you shouldn’t have any problems using 1%. Good luck! This was so very yummy. I used thawed frozen corn. Made sure to get extra moisture out so recipe wouldn’t be soupy. Next time I will use more cheese! I will making this again & again. It was that fabulous!! Thank you so much Marie! It brightens my day to hear that :) So happy you liked it. And I totally support all the cheese! I stumbled across this recipe trying to use ingredients I had for a meal. In the oven cant wait to try it! Kimberly that’s awesome! I’m a huge fan of building dinner out of stuff I already have. Hope you like it! 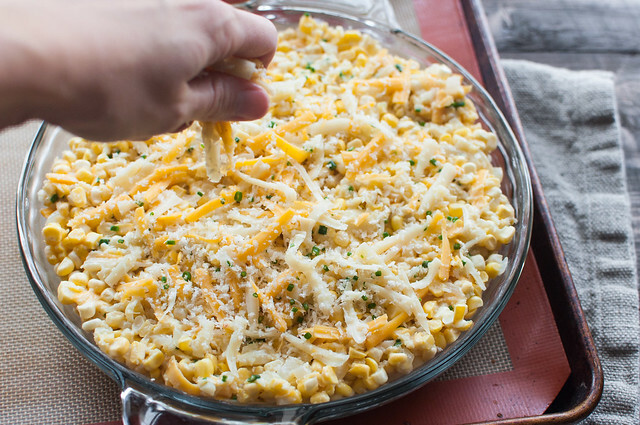 Jackie, in this recipe when I say “soft cheese”, I mean anything that can be grated and that melts well–mild cheddar, havarti, mozzarella, and young/creamy gouda would all be great choices! I made this today and was very disappointed. The dish was very pretty but very bland. The only thing I did different was added red and green bell peppers and a little sugar but it still was pretty bland. I may try again but I’ve got to figure out what I can do different to add more flavor. Hi Wendy, thanks for the honest feedback. This dish is definitely a nod to my Midwestern roots, where we don’t like things too crazy :) However, some more ideas would be a little chili powder or a pinch of cayenne, amping up the variety and quantity of fresh herbs, or venturing out with your cheese selection. Thanks for your willingness to try it again! This looks fabulous and I know it would be a hit on my family vacation. Could it be frozen ahead of time for easy traveling? YES! Both this and my spaghetti squash pie recipe (and lots of my other casserole recipes for that matter) do really well in the freezer. You can reheat pieces individually in the microwave, but the best is to just heat the whole thing in about a 300-325 (F) oven (lower temp to avoid overcooking the egg), partially covered (vented foil works well) until warm. Happy vacationing! hi! i have about 9 cups of fresh corn do you think this would work well in a 9×13 dish if i doubled the recipie to use up the 9 cups of corn? also i has thought about browning off some sausahe crumbles to add in for flavor . what do you think? Kendra, all of that sounds perfect! Not sure how many you’re feeding, but any leftover slices will freeze well wrapped in smaller portions. With the sausage it sounds like it would also be great for breakfast/brunch! Cooking time might be a little longer–just make sure the middle is close to set before you take it out of the oven. Thanks Tessa! It’s in the oven now. It has been in for about 1 hour and 15 min so far not sure haw it’s supposed to look inside as far as being set. It has definitely risen but it still seems eggy inside .. can’t wait to try it! I make something similar, but with a combo of corn and broccoli, and baked in a water bath. That might be helpful for people who are having problems with the eggs not setting. And then I serve it with rice. Makes a nice complete meal. Hi Tessa! We made this amazing corn pie for our 12 person dinner party group of friends. I made 2 pies the day before the party, refrigerated them and just rewarmed them in the oven. We served it with blackberry glazed baby back ribs and a caprese salad. The corn pie was a HUGE HIT! There were no leftovers! I made it exactly as written, but only needed 4 ears of Olathe,CO sweet corn per pie. Since I had 2 ears of corn leftover, I’m making the pie again tonight! It is sooo yummy! That is awesome Lee ann! It’s about 15 minutes until I eat lunch and your menu has my mouth watering right now. I’m not a huge meat eater but the ribs sound AMAZING. So glad you liked the recipe, and thanks for sharing about it! Do you cooked the corn first then cut off the cob? Sorry! I’m confused!! Haha, doesn’t take much. Not a bad question! No need to cook the corn before proceeding with the recipe–just cut it off the cob and use it! I have this in the oven now. I used the sweet corn my hubby grew on our garden (well, the corn the darn squirrels didn’t get). Can’t wait to taste it! Thank you! The home grown corn will make it 10x better, I’m sure–enjoy! Absolute perfection! Taste, texture and looks were awesome. Out guests raved about it. My corn was fresh from the cob that had been leftover and frozen. I used 1/2 sharp cheddar and 1/2 provolone because that is what I had on hand. I also used 1/2 whole milk and 1/2 evaporated milk, again because that is what I had to use up. I prepared the dish early in the day, refrigerated it and then removed it to room temperature about 45 minutes prior to baking. Will definitely make this again! Awesome! I never thought to freeze corn right on the cob–will have to try that next summer. And thanks for sharing your adaptations. I just recently discovered the decadence of evaporated milk via a mac and cheese recipe, so I’m sure it was perfect in this! I added bacon bits and made my own breadcrumbs. Just delicious!!! Thank u so much! I’d recommend baking it in advance, since it contains raw eggs. You can easily refrigerate it for a couple days, and it actually is sometimes better after being in the fridge for a couple days. Enjoy! This looks absolutely delicious, and I think it would make an amazing addition to a potluck style supper. In the summer out here in the country, we often get together and have potlucks. I can’t wait to take this to the next one! We just make this! Added some sautéed red pepper and it’s AMAZING! Oh my goodness!! Delicious! I made it with frozen corn, can only imagine how good it is using fresh corn. This will be made again for sure.